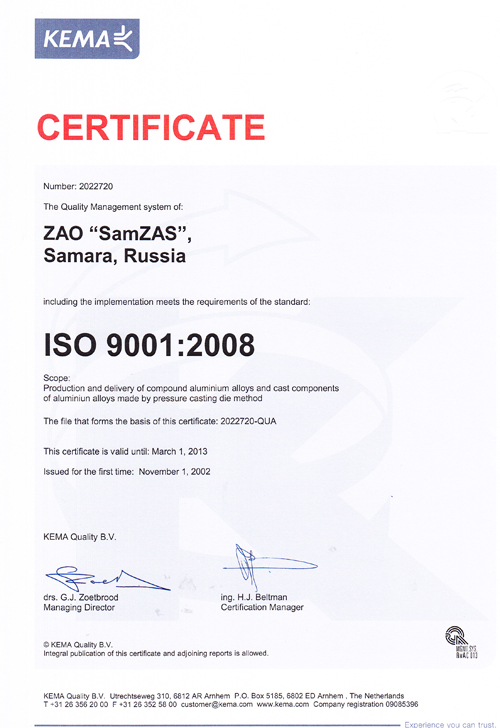 The factory is certified by ISO 9001:2008 (accredited by KEMA and IQNet). The production is equipped with all necessary machinery that allows to produce secondary aluminium alloys conforming to the requirements of GOST (State Standard) 1583-93, to the additional customers demand in the form of ingots (15-18 kg), and a wide variety of castings for machine-building plants in Russia and the former countries of the USSR (foreign countries that lay nearby). CJSC "SamZAS" has an accredited laboratory of spectral analysis and physico-mechanical testing of non-ferrous metals and alloys (certificate №29/24-111). It can identify the chemistry composition of casting alloys, melting scrap and non-ferrous waste with accuracy requirements and according to the certification. The laboratory has modern domestic and foreign equipment.